Feb.5, Big Sandy – Rockabilly L.A.
LIVE MUSIC WITH BIG SANDY & HIS FLY RITE BOYS! C.K. Farnsworth and His Mobile Soda Fountain will be on hand for your ice cream needs serving his good old fashioned ice cream treats in the tradition of the old Soda Fountains from the 1920s and 1930s. YIPPEE AY OH KAY YAY, BUCKAROOS! Birthdays come and birthdays go, and we know how to make them a blast on the swing dance scene. 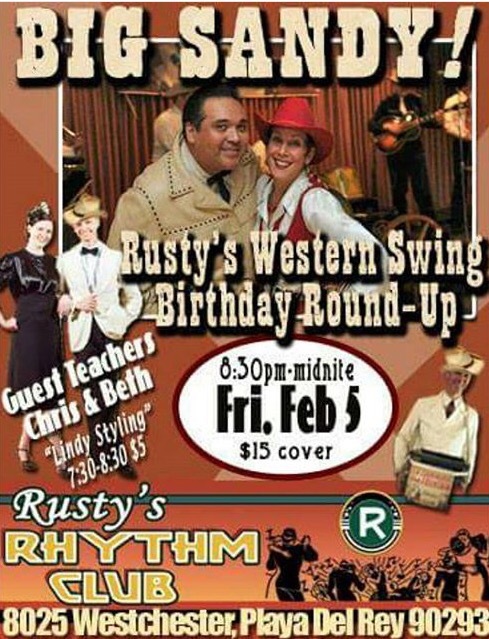 This year I am pulling out the stops by finally getting Big Sandy and His Fly-Rite boys in the door for their Rusty’s debut. And what would my birthday dance be without pulling out my favorite outfit – a replica of my childhood cowgirl outfit. I hope all my swing dance boy friends (and all you leads, male/female) will come out to give me the best birthday dance ever. Since forming in 1988, Big Sandy & His Fly-Rite Boys have emerged as one of the world’s most respected practitioners of American roots music, western swing, rockabilly, and traditional country—playing it like they invented it. “I think of us as just a rock and roll band, a rock and roll band that’s letting the roots show,” says bandleader Big Sandy. Whether they’re playing the Grand Ole Opry, Late Night With Conan O’Brien, or simply climbing out of a bus after rolling into your town, these guys are bringing us some great old-time rock & roll.